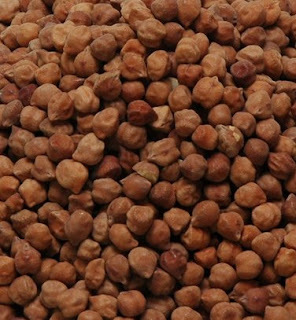 Kala chana, also known as black Bengal gram is a fave of mine. Apart from being delicious and versatile, it has an impressive nutritional profile. It contains a good amount of iron, sodium and selenium and small doses of manganese, copper and zinc besides being a very good source of fiber and folic acid. It is the richest source of proteins in legumes. Soak them overnight and then pressure cook in salted water. Sprout them to enhance their protein and vitamin content. This dish here is sooo delicious and basically just a mix of flavors and textures. Just like a salad, throw in any fruit and vegetable you fancy and flavor as per your taste. 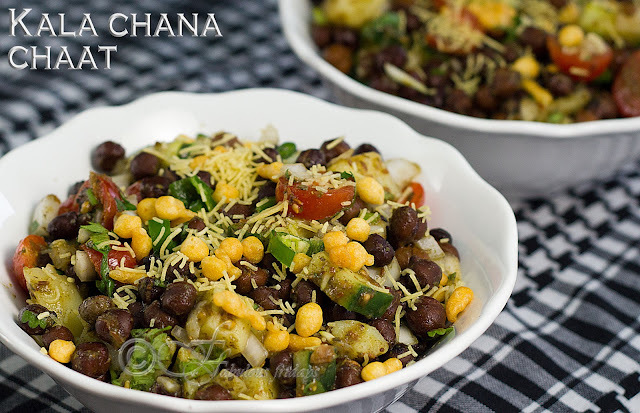 I have mixed this one like a chaat with sweet, sour, salty and tangy flavors and soft and crunchy textures all in one. Try it. Guaranteed delicious. 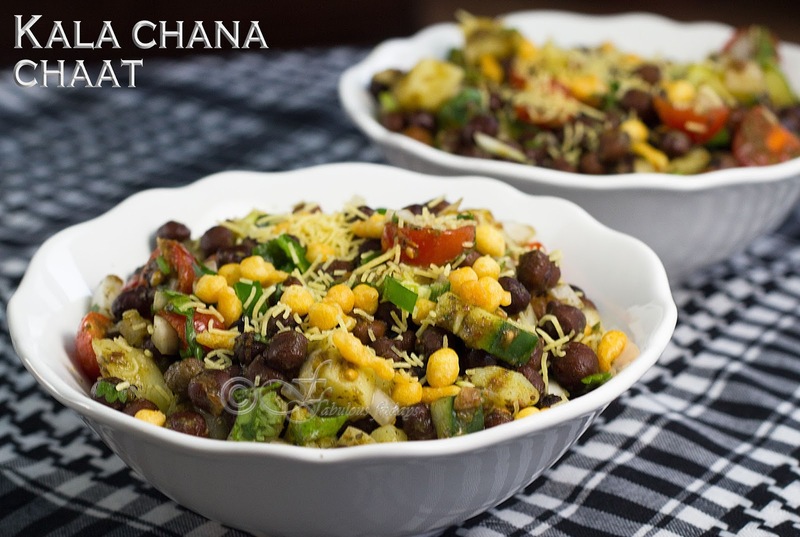 Place the soaked chana with a little water and a 1/4 tsp salt in a pressure cooker. Cook on high till the first whistle. Reduce heat to simmer and cook for 20 minutes. While the beans are boiling, chop and dice boiled potatoes, onion, tomato, cucumber, green chilies, coriander, mint and ginger. If the cooked chana has some water left over, strain it and use the water for curry or soup. Placed the boiled chana in a large bowl. Add all the chopped veggies and herbs. Add all the spices to taste. Add lime juice and zest and flavor with the mint and tamarind chutney. As you add all these spices and sauces, taste every so often to check the sweet, salty and sour ratio. Add chopped sour raw mango and/or pomegranate seeds, if using. Mix well. Serve cold or at room temperature as a starter. We have even had this for lunch as a salad. Just before serving sprinkle seviyan and fried boondi on top for the crunch.